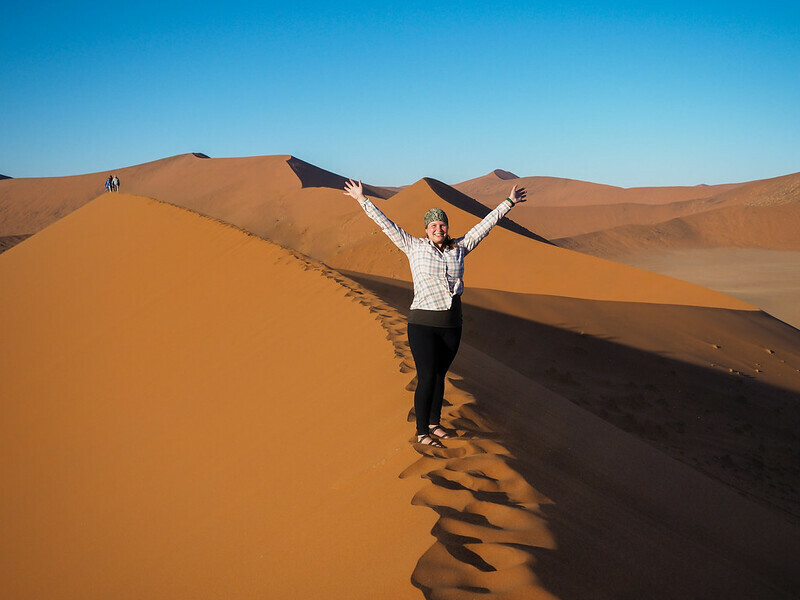 When I first started planning my trip to Southern Africa, there was one thing at the top of my to-do list: to visit Sossusvlei and its famous orange sand dunes in Namibia. Every overland tour I looked at, every itinerary I considered, that was the number one thing I looked for. 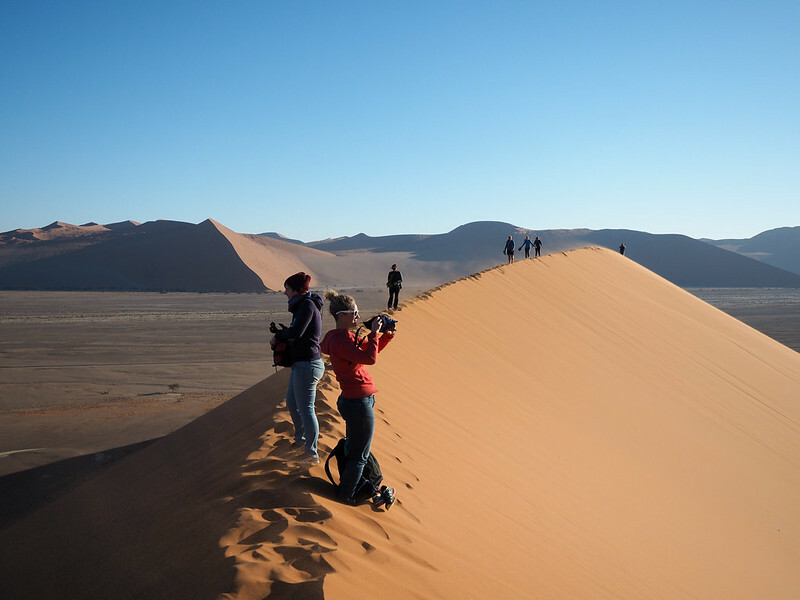 If a tour didn't include a trip to the Namib-Naukluft desert, it went way down on my list of possibilities. I wasn't going to go all the way to Africa and not see those dunes! Thankfully, the overland tour I chose with Acacia Africa had us spending a full day in Namib-Naukluft National Park. Our morning started early – well before sunrise, in fact, since we had to drive about an hour to the entrance to the park. We had our tents packed up by 4:30 a.m., and were dozing on the truck as the night slowly began to give way to daylight. Many people plan to climb one of the famous dunes at sunrise, but we were still waiting at the gate at the entrance to the park as the first rays of sun began creeping above the horizon. This was fine with me, though. It meant that when we were finally let into Namib-Naukluft National Park, we could see all the dunes we were driving past in the early morning light. The most famous sand dune in the park is Dune 45 – so named because it's located 45 kilometers from the Sesriem gate. This was our first stop of the day, where we admired the shadows and bright orange color of the 550+ feet of sunkissed sand before tearing off up it before more dune-climbing tourists showed up. It was still nice and cool when we started our climb (helped by the fact that it was wintertime in Namibia), which I was thankful for after about the first 50 steps. Unlike the dunes I climbed at White Sands National Monument in New Mexico last year, Dune 45 is not made from densely-packed damp sand that holds up under your feet. No, Dune 45 is made of fine, loose sand. The sort of sand where you sink one step backwards for every two you take forwards. You think you've reached the top, and then you see THIS. These dunes seem to go on forever. I eventually made it to the top, where I found a couple people from my group still posing for photos and postponing having to go back down to the truck. Looking down from on top of the dune. By the time we headed back down the dune, the sun was warming up the sand and a strong wind had come up, whipping fine grains against our ankles and calves. Look at all that flying sand! I shoved my camera inside my coat, and we all had fun running down the last part of the dune. At the bottom, we had our breakfast at the truck and thanked our guide, Philile, for making us get up so early. By this point, Dune 45 was teeming with people climbing it. And let me tell you from experience that it's NOT very easy to pass people on the unstable spine of a sand dune like this! After packing the truck back up following breakfast, we drove a little further into the park and transferred from our huge overland truck into a smaller safari vehicle. Now it was time to head to Deadvlei, another spot I was looking forward to. The first glimpse of Deadvlei. The safari vehicle dropped us off at the parking area, and then we had to hike for about a kilometer through the soft sand to Deadvlei itself. Once again, I was very glad to be making this trip in the winter. In the summer months, it would be too hot to even attempt past about 10 a.m.
Deadvlei is an incredibly surreal place. It's almost like a Dali painting come to life. The dead trees contrast with the towering dunes (some surpassing 1,000 feet here), which contrast with the bright blue sky. It's a great place for photos. Look how huge this dune is!! After a fair amount of time for photos, we headed back across the sand and eventually back to our overland truck for lunch. It's hard to believe, but we packed all this sandy adventure into just half a day. And what a day it was. My day in the sand in Namibia definitely lived up to expectations. Be sure to put this one on your bucket list, too! GO EARLY – You want to get to the dunes as early as possible, both to avoid the heat of the day (sand gets HOT in the sun), and all the other tourists. We were one of the first vehicles into the park, and therefore one of the first groups to start climbing Dune 45. If you actually want to be ON the dune for sunrise, you'll have to stay at the campsite that's inside the park. BRING WATER – You're in the desert, and even if you're visiting in the winter and not really sweating much, it's still going to be extremely dry. 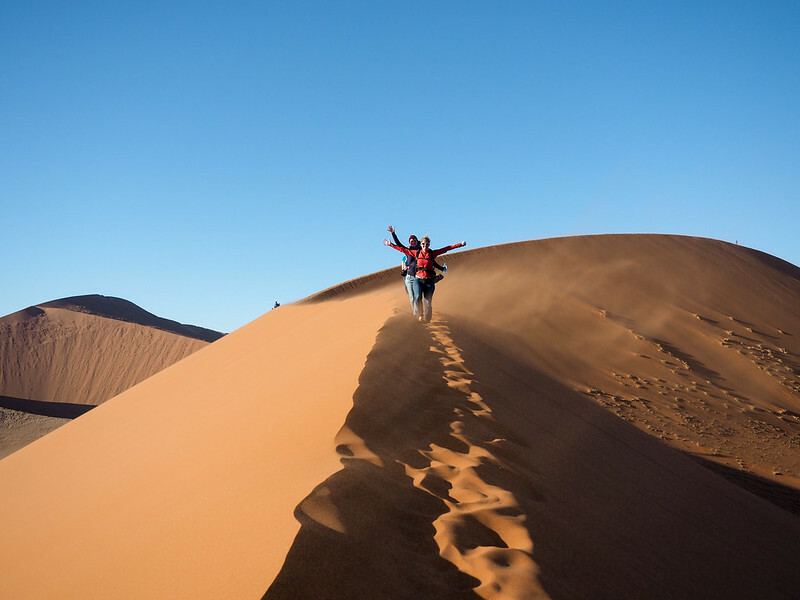 Make sure to carry water with you, especially for the dune climb and/or the hike to Deadvlei. WEAR PROPER FOOTWEAR – Walking in sand is tough, and it's made tougher if you're wearing the wrong type of footwear. If you only have sneakers/boots with you, it's actually recommended to climb the dunes in your socks (socks because the materiel in between your toes helps you get better traction). This way, your shoes won't get filled with sand a weigh you down. I chose to climb in my , which are PERFECT for the desert since they give you traction without filling up with sand. PROTECT YOUR GEAR – It can get very windy up on the dunes, so if you're taking a camera with you you'll want to make sure you can protect it from all that flying sand. I brought my daypack (I love ), wrapped my lens up in a scarf, and frequently stuffed my camera inside my jacket as I was climbing. The last thing you want is for you camera to get ruined by sand! Is this part of Namibia a place that YOU would like to visit? It’s been so long since I’ve seen that movie! It certainly is a surreal place to visit, though. Love the pictures! Deadvlei is especially cool. To think that those trees have been around for so long! I don’t think I’d be up for all that hiking, though. Wow what a cool place to spend a day! I love the dead trees against the orange sand. Although I feel my legs would hate me, I would definitely spend a day here! Oh yeah, legs definitely hated me – but it was absolutely worth it! Thanks for sharing. Great photos! I’m hoping to get there next year. I highly recommend it if you’re in this part of Southern Africa! This has been on my bucket list for ever! I love the pictures, I once climbed a sandy slope like that in Bolivia, and it is a bit scary! What time of the year is winter there? 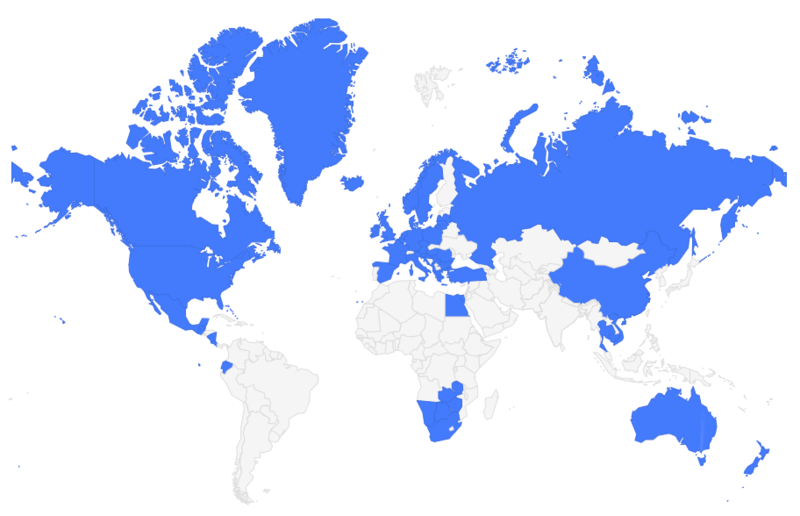 Namibia is in the southern hemisphere, so winter is during North American summer (so roughly late May-August). Ha I always get really good photos too when I’m hiking or walking. It’s indeed the best way to get a few seconds of rest 🙂 Namibia looks gorgeous! Haha, yes! Always a good excuse to rest for a few seconds! And Namibia is indeed gorgeous. I’m so glad I finally made it there. Wow, it looks so desolate there! Definitely. It’s beautiful, but quite desolate in the desert! 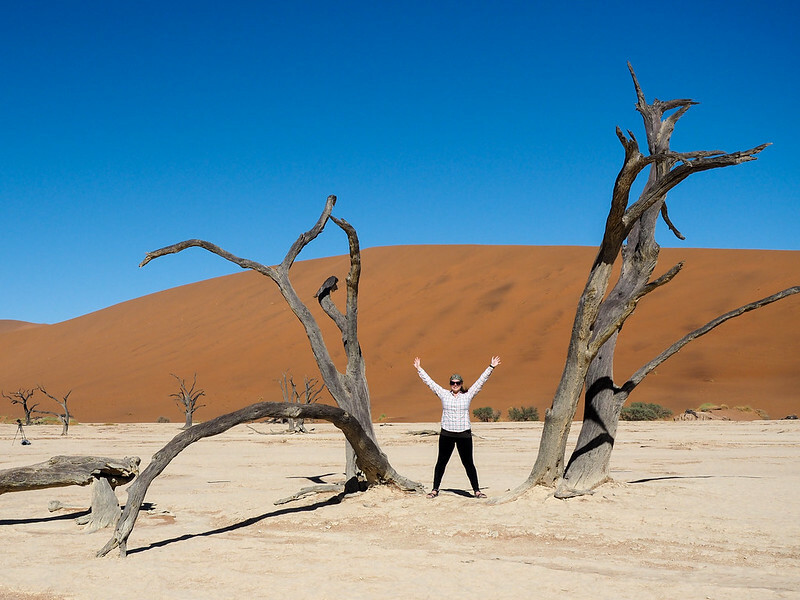 My Southern Africa trip was all just so incredible – I highly recommend visiting this part of the world if you can! you have captured awesome photos of that beautiful place of Namibia. Thank you! It was a fun place to photograph, though you definitely have to be careful with all the sand! It was awesome to finally be able to see it in person! Such a cool place. Glad you had the opportunity to crossed off the sand dunes on your list. It was totally worth it. I’m itching to photograph those incredible trees, they make an interesting subjects for photographs. Yes the trees are very cool to photograph! Not to mention those huge dunes! Gorgeous photos! Sosussvlei is easily one of my favorite places in the world. I can understand why – there’s really no other place like it! Namibia is such an interesting place – it doesn’t get a lot of publicity like Kenya or Tanzania, but it certainly is photogenic! Very photogenic! I was really (pleasantly) surprised by Namibia and would definitely recommend it! Awesome, I’d love to visit that place, Deadvlei. Looks terrific! I’ve been to the Sahara desert a few times, in Morocco and Mali, and there is something unique about desert that I love; the total silence… the beauty of a dead landscape! I hope I’ll visit Namibia on my next trip to Africa! Wow! What can I say? Beautiful desert backdrops and all along I have been thinking that nothing good can come out of a desert. Namibia looks inspiring, incredibly beautiful and a perfect vacation destination. I love this post. Deserts are beautiful in their own way!